The 101 Must-Do's for Kiwis guide puts it like this: "Aoraki Mount Cook towers above the Southern Alps and there's nowhere that you can get as close and personal with this mountain than at the Aoraki Mount Cook Village." and to drive the point home it goes on "The possibilities are endless in this UNESCO World Heritage Area, but one thing's for sure: wherever you are, when the sun is about to set, make sure you turn to watch Aoraki Mount Cook's snowy crown painted in shades of pink, purple and red." How could we miss out on this. So here we are now, in a cosy little double room in the local YHA. Unfortunately we got rain and clouds instead of the sun and blue skies for company. It seems though that today wasn't all that bad, since tomorrow the weather is supposed to get much worse. 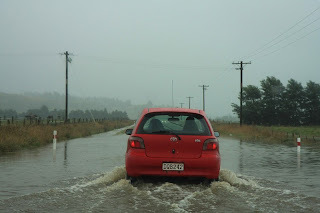 As we drove up here today, whole sections of road between Oamaru and Omarama were flooded after only two days of rain. 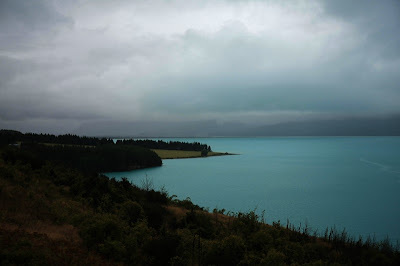 We read in a guide book that the Mount Cook area gets over 4 meters of rain a year. Part of this seems to be happening over this weekend.